I found this section of the Vienna Central Cemetery (Zentralfriedhof) beautiful, but haunting and melancholy. 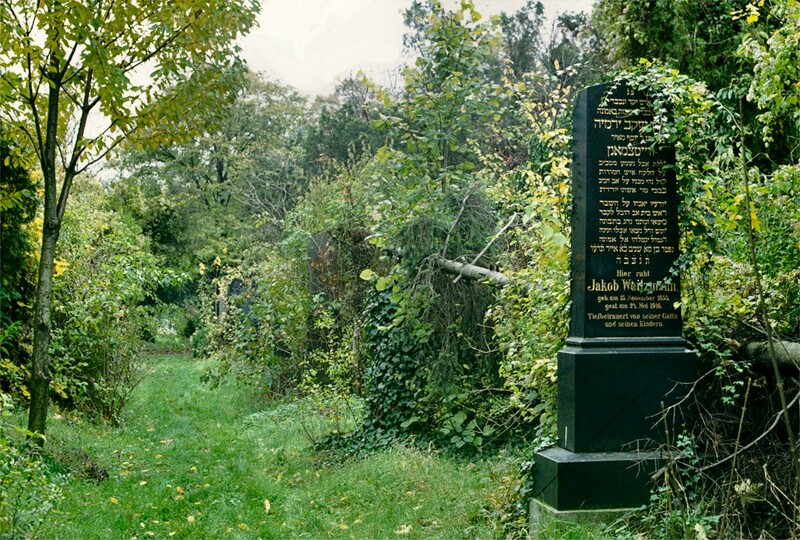 Given the destruction of the Jewish community during World War II, few were left to care for it, and it is returning to nature. 2. Diskettes should be cleaned and waxed once a week. Microscopic metal particles can be removed by waving a powerful magnet over the surface of the disk. Any stubborn metallic shavings can be removed with scouring powder and soap. When waxing diskettes, make sure application is even. This will allow the diskettes to spin faster, resulting in better access time. 3. Do not fold diskettes unless they do not fit in the drive. “Big” diskettes may be folded and used in “little” diskette drives. 4. Never insert a diskette into the drive upside down. The data can fall off the surface of the disk and jam the mechanics of the drive. 5. Diskettes cannot be backed up by running them through the Xerox machine. If your data is going to need to be backed up, simply insert two diskettes together into the drive. 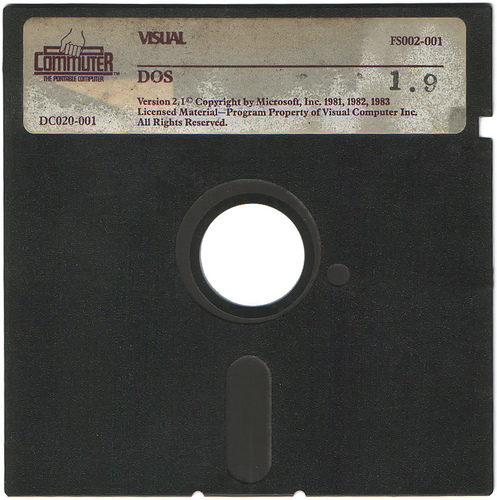 Whenever you update a document, the data will be recorded on both diskettes. 6. Diskettes should not be inserted or removed from the drive while the red light is flashing. Doing so could result in smeared or possibly unreadable text. Occasionally the red light continues to flash in what is known as a “hung” or “hooked” state. If your system is “hooking” you, you will probably need to insert a few coins before being allowed to access the disk drive. 7. If your diskette is full and you need more storage space, remove the disk from the disk drive and shake it vigorously for two minutes. This will pack the data enough (Data Compression) to allow for more storage. Be sure to cover all the openings with scotch tape to prevent loss of data. 8. Data access time can be greatly improved by cutting more holes into the disk jacket. This will provide more simultaneous access points to the disk. 10. Never use scissors and glue to manually edit documents. The data stored is much too small to be seen by the naked eye, and you may end up with data from some other document stuck in the middle of your document. Razor blades and scotch tape may be used, provided the user is equipped with an electron microscope. 11. Periodically spray diskettes with insecticide to prevent system bugs from spreading. Despite the fact that in the last 21 years, computing power has increased by orders of magnitude from what it was in 1990, this article still makes some intriguing and valid points, and is reproduced here for your edification. Today, multiprocessor micro­computers handle hundreds of tasks at virtually the same time. Desktop workstations perform operations that are more complex than those performed by room-size main­frame computers five years ago-and they do it faster. We are using AI systems in real applications without expenditures of millions of dollars. It seems that we are entering the age of truly intelligent systems. But consider the bee wolf. This seem­ingly insignificant creature is a bee­hunting fly that tunnels its single-occu­pancy home in beach sand. Even though hundreds of bee wolves have their tun­nels in the same area of a beach, each bee wolf will return to its own home and no other. A biologist covered the opening of one bee wolf’s tunnel with sand to see what the insect would do when it returned and found no tunnel. Without hesitation, the bee wolf went to the location of its entry and began digging. The biologist noted that each time the bee wolf left for a hunt, it would fly a pat­tern above its home before departing. 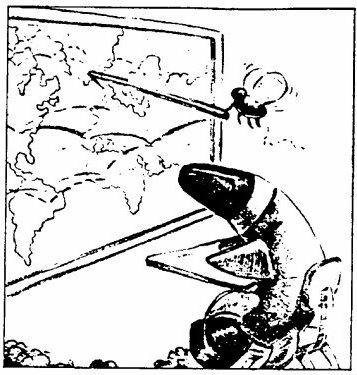 The creature appeared to be memorizing landmarks. The biologist tested his theory (not to mention the bee wolf’s patience with biologists) by sketching the layout of pinecones around the entrance while the unsuspecting subject was at home. Soon the bee wolf emerged from the tunnel and flew its pattern before heading out in search of prey. Once the bee wolf had departed, the researcher moved the array of pinecones over about a half-meter. When the bee wolf returned, it at­tempted to find its private cave at the cen­ter of the relocated pinecones. It dug in the sand for a second or two but found no tunnel. Unlike members of our species, the bee wolf did not call its lawyer, psychia­trist, or parish priest. Instead, it realized that something was amiss and flew a higher pattern over the territory. From this new perspective, it was able to dis­card the erroneous references to pine­ cones and promptly located the true en­trance. 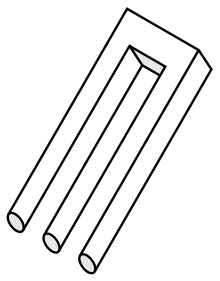 The first computer analogy to this rec­ognition and guidance problem is in a military application. The self-navigating cruise missile uses a system called ter­rain-contour matching (TERCOM). In­side the cruise missile’s guidance com­puter is a set of computer-encoded maps of checkpoints along the programmed flight plan. At these checkpoints, the TERCOM computer compares readings of a radar altimeter with a contour map stored in its memory. If the computer finds no match between the expected data and the real data, it searches for a match with the map of the surrounding area. Once the match is found, the com­puter adjusts the course of the missile to account forthe error. To fool the cruise missile, you just move the target, leaving behind a dummy target. Because the cruise missile de­stroys itself in the process of destroying its target, it never can discover that it has made a mistake. Even though the flight-control com­puter in the missile weighs less than 100 pounds, it has the equivalent of millions of transistors. Producing each of these computers costs a good part of a million dollars. In contrast, the bee wolf s brain, which is no bigger than the head of a pin, must carry on far more complex opera­tions than just finding its host’s way home. It must provide control to an aero­dynamically instable machine, its body. The bee wolf also can walk, dig, locate and outmaneuver its prey, and find a mate (a task that would be disastrous for a cruise missile). Compared to the bee wolf, the cruise missile is downright stupid. Many people falsely place computers in a scale of intelligence well beyond that of the human mind. But even a person with severe learning disabilities per­forms far more complex mental opera­tions in a far shorter time than the largest and fastest computer. What size com­puter and program could control a walk­ing robot that could rise from a chair, put on a coat, go outside, walk around the building on rolling terrain, establish the location of the entrance from visual in­formation, and reenter the building-all this, while maintaining respiration, blood flow, and the input from millions of sensors for pressure, temperature, light, sound, and chemical analyses and production? 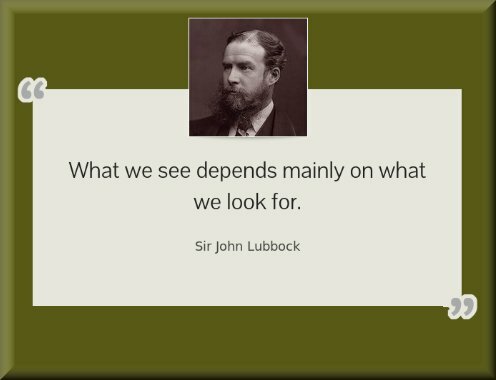 Now consider the scope of the human brain. How much data is rep­resented by all the memories in just one human being? 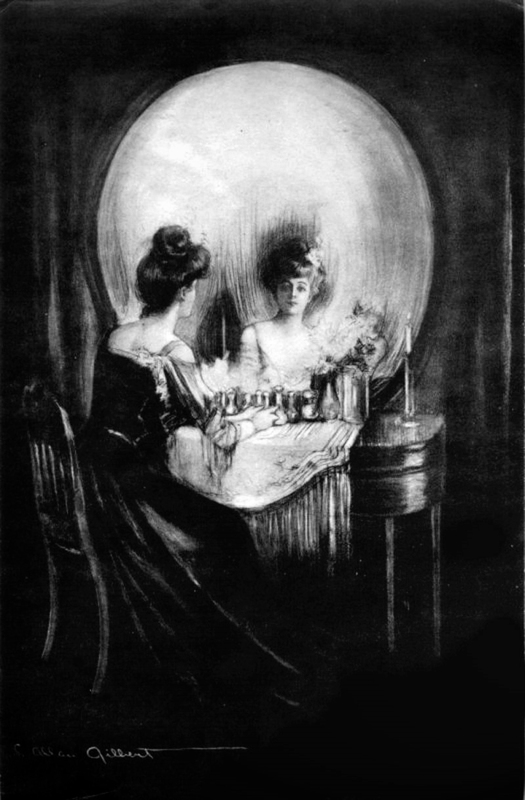 What complex relation­ship exists between memories to create knowledge? Ben Smith is a BYTE technical editor. The environment that nurtures creative programmers kills management and marketing types – and vice versa. Programming is the Great Game. It consumes you, body and soul. When you’re caught up in it, nothing else matters. When you emerge into daylight, you might well discover that you’re a hundred pounds overweight, your underwear is older than the average first grader, and judging from the number of pizza boxes lying around, it must be spring already. But you don’t care, because your program runs, and the code is fast and clever and tight. You won. You’re aware that some people think you’re a nerd. So what? They’re not players. They’ve never jousted with Windows or gone hand to hand with DOS. To them C++ is a decent grade, almost a B – not a language. They barely exist. Like soldiers or artists, you don’t care about the opinions of civilians. You’re building something intricate and fine. They’ll never understand it. Here’s the secret that every successful software company is based on: You can domesticate programmers the way beekeepers tame bees. You can’t exactly communicate with them, but you can get them to swarm in one place and when they’re not looking, you can carry off the honey. You keep these bees from stinging by paying them money. More money than they know what to do with. But that’s less than you might think. You see, all these programmers keep hearing their fathers’ voices in their heads saying “When are you going to join the real world?” All you have to pay them is enough money that they can answer (also in their heads) “Geez, Dad, I’m making more than you.” On average, this is cheap. And you get them to stay in the hive by giving them other coders to swarm with. The only person whose praise matters is another programmer. Less-talented programmers will idolize them; evenly matched ones will challenge and goad one another; and if you want to get a good swarm, you make sure that you have at least one certified genius coder that they can all look up to, even if he glances at other people’s code only long enough to sneer at it. He’s a Player, thinks the junior programmer. He looked at my code. That is enough. If a software company provides such a hive, the coders will give up sleep, love, health, and clean laundry, while the company keeps the bulk of the money. But…control of what? Instead of finding assembly lines of productive workers, they quickly discover that their product is produced by utterly unpredictable, uncooperative, disobedient, and worst of all, unattractive people who resist all attempts at management. Put them on a time clock, dress them in suits, and they become sullen and start sabotaging the product. Worst of all, you can sense that they are making fun of you with every word they say. The shock is greater for the coder, though. He suddenly finds that alien creatures control his life. Meetings, Schedules, Reports. And now someone demands that he PLAN all his programming and then stick to the plan, never improving, never tweaking, and never, never touching some other team’s code. The lousy young programmer who once worshipped him is now his tyrannical boss, a position he got because he played golf with some sphincter in a suit. The hive has been ruined. The best coders leave. And the marketers, comfortable now because they’re surrounded by power neckties and they have things under control, are baffled that each new iteration of their software loses market share as the code bloats and the bugs proliferate. Got to get some better packaging. Yeah, that’s it. Even though Mother slipped quietly into the Great Beyond last year at the respected age of 94, she still gets mail from all sorts of places – 99% of them wanting her money. Yesterday our mailbox was graced with a 32-page full color glossy brochure (even had circles and arrows) from an outfit named Biowell, guaranteeing her a restored memory and the mind of a 20-year-old if only she would buy a 6-month supply of MentaFit Ultra at the special price of $269.95. Now, don’t get me wrong. I happen to believe that nutritional supplementation is an essential part of good health, especially given the Standard American Diet (aptly abbreviated SAD) which is chock full of high-glycemic carbohydrates, fats, and very little actual nutrition which our cells are screaming for. Unfortunately, the largely unregulated supplement industry is a hotbed of fraud, waste, and abuse, and there are precious few reputable companies out there. 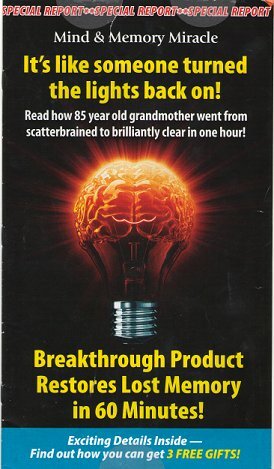 The product was designed specifically to correct mental decline and is the ONLY treatment to help rejuvenate your mind, so you stay mentally healthy into your 80’s, 90’s, and even longer! Biowell’s B Vitamin Complex (free with the maximum order) will help REVERSE BRAIN SHRINKAGE! Just one single ingredient is so powerful it even helps exhausted ER doctors stay alert all night long! A steel-trap memory can be yours… Call now and let it go to work in your brain, clearing out the rust, restoring sharpness, clarity, order and youthful vitality better than any other formula! Will help you return your mental state back to your 20’s in only ONE HOUR! You can restore up to 70% of your memory loss due to aging! And on and on. Pages and pages of references to obscure and misinterpreted studies, pictures of doctors, hyped up claims about the individual ingredients (sage, rhodolia rosea, vinpocetine and Vitamin D3), and hype worthy of a used-car salesman. And a bottle of this relatively worthless stuff sells for $49.95, where it probably cost $3.95 to manufacture, all without any guarantee whatsoever of quality. Face it – if things like this worked even a fraction as well as they claimed, every doctor in the world would be prescribing it, and Alzheimer’s disease and dementia would be a thing of the past. There’s a huge irony in targeting advertising materials like this at the elderly. They are losing mental acuity as the result of natural aging processes, and hence are more susceptible to slick advertising campaigns which promise outlandish results and offer false hopes, for the low low price of whatever. And Biowell is only one of hundreds of outfits out there who are dedicated to only one proposition: extracting money from unwary and vulnerable consumers. In the last 10 years of my mother’s life, I had to deal with dozens of companies who sold her things she didn’t want, didn’t need, couldn’t use, and didn’t understand – and most of it was (to be charitable) camel ejecta. “Do not resent growing old, it is a privilege denied to many,” said someone wise. Aging is a normal part of life; every time our cells divide, our telomeres get a bit shorter, and thus far science has not found a way to reverse the process. All physical degeneration can be slowed, however, by making sure the body has ample supplies of the elements needed to keep our cells functioning at the top of their game – vitamins, minerals, co-factors and antioxidants – and sadly we don’t get everything we need from our daily diets. Supplementation is a must for optimal health, but there are only a handful of companies out there that manufacture effective products. If you take things like One-A-Day or Centrum, you might as well be swallowing rocks for all the good you’re doing yourself; do your research – look for companies that follow pharmaceutical good manufacturing processes, and whose products are submitted to independent laboratories like NSF, and which exceed industry standards for completeness, bioavailablilty, purity, potency, and safety. Protect your elderly loved ones from worthless products and questionable marketing campaigns. Be involved in their lives, and make sure that you are aware what they are spending their hard-earned money on. Telemarketers are ruthless, and mail solicitations are deceptive and misleading – most supplements offered through the mail are worth less than the powder to blow them to Hell with. 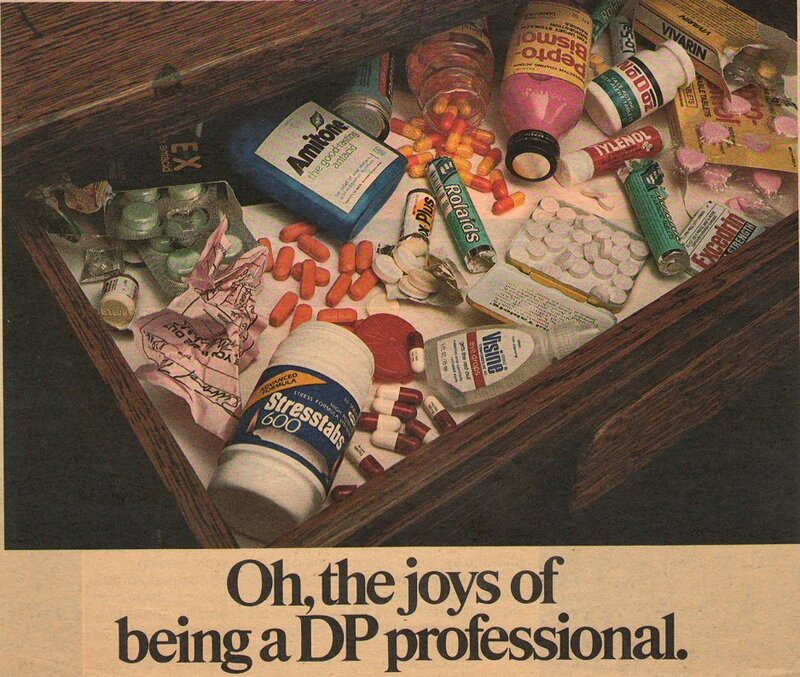 Get on some high-quality supplements. What you need won’t be found at your grocery or discount store – do your homework and get informed. Your body will thank you for it. 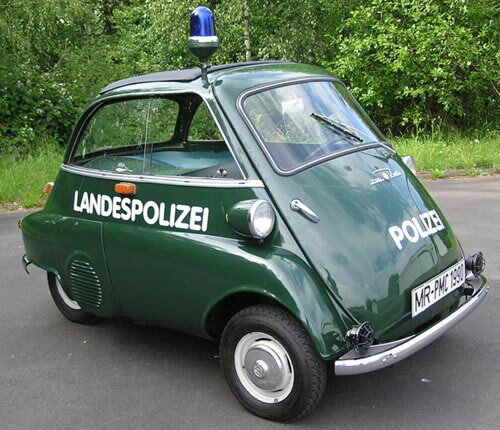 Germany: Isetta transformed into a copmobile. Found at Frog Blog. 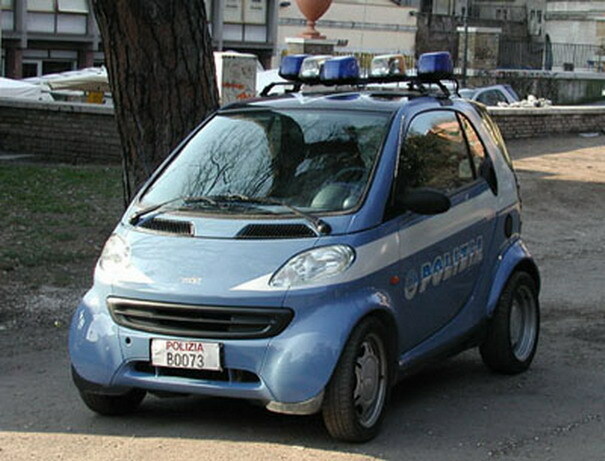 Italy: Smartcar as Police Vehicle. 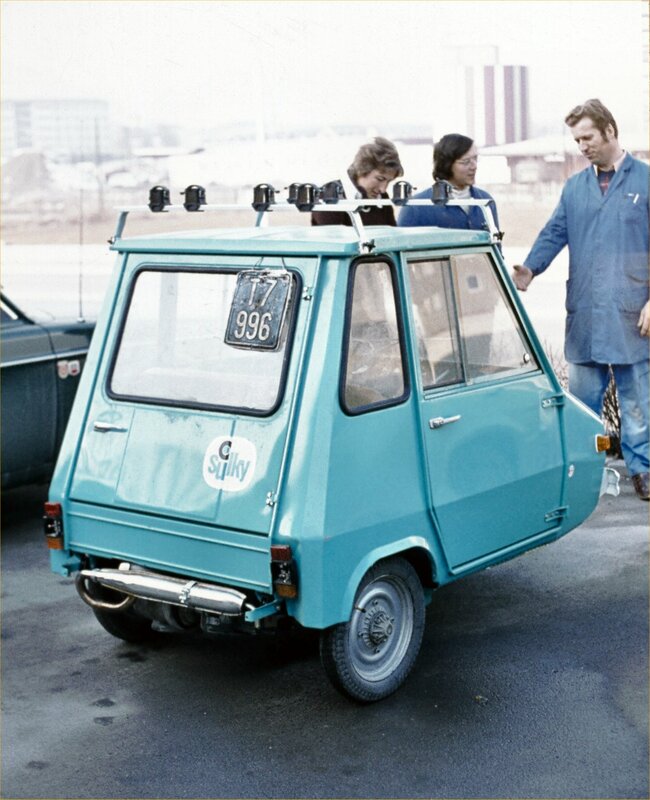 This was a prime example of an early Casalini “Sulky”, a microcar with a 50cc engine (really nothing more than a moped with a housing). 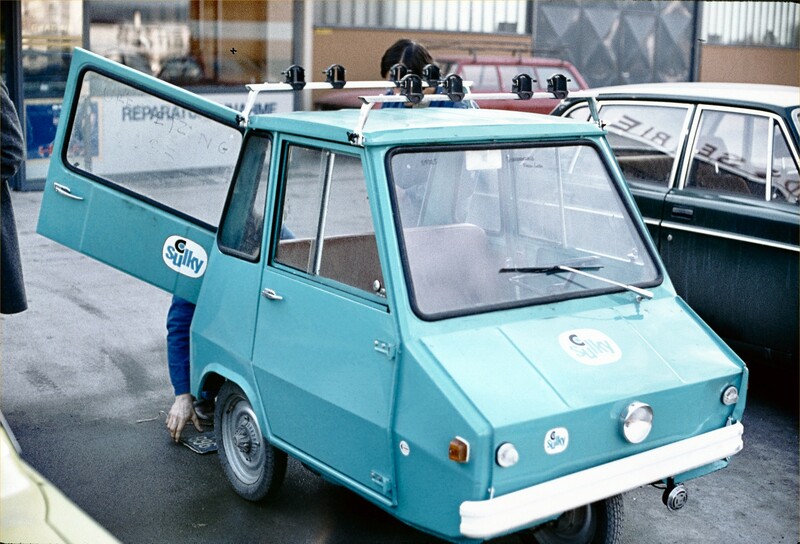 First produced in 1969, it was designed for people without a driver’s license and had a top speed of 45 mph. 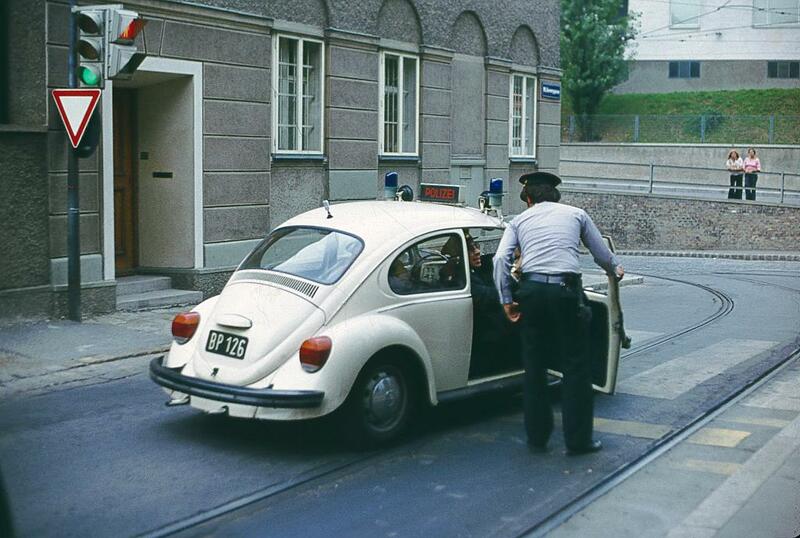 This one was found in Innsbruck, Austria, in 1976. But there are many others. The one below is one of my all-time favorites – it contains both the words “optical” and “illusion”, depending on where you look. The spatial-perception phenomenon is exquisitely illustrated among the geometric shapes below – what you see depends on whether you are looking at the blocks, or at the spaces between them. This one is uncanny. 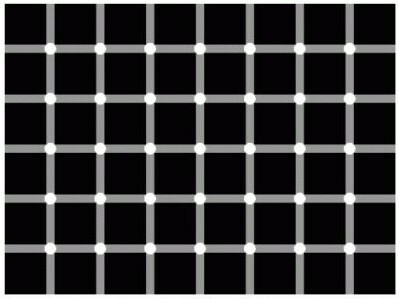 Stare at the “+” for a while, and watch the dots gradually vanish.  Similarly, if you stare at any point in the image below, the entire thing will gently fade away. 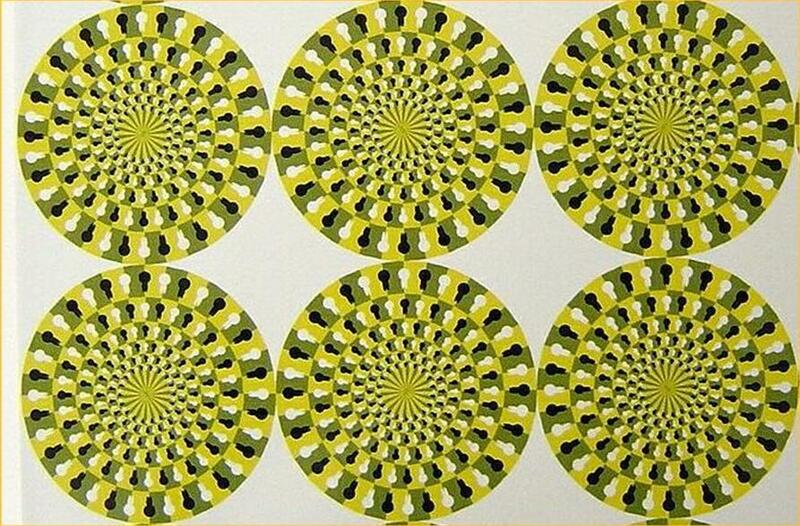 The wheels below are not moving. Really. The following one is a mindbender. Stare at the spinning dancer for a while – she’ll switch from clockwise to counterclockwise at random. Some people can shift their perception of her at will, but I’ve never found the knack. If you’re having trouble, the gif file below has been tweaked to let you switch back and forth with less difficulty. Look at the image on the left, and the silhouette will rotate clockwise. Look at the one on the right, and she’ll change directions for you. Edit: Here’s one that’s similar, but a bit easier to manipulate. Kind of uncanny. And on that note, here’s the “flashed face distortion,” which is pretty darn creepy – but it’s a real thing. 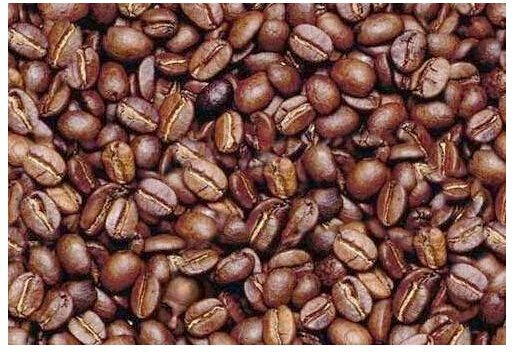 This modern one is less of an illusion than a perceptual challenge – how long did it take you to find the face among the coffee beans? With technology come new challenges. 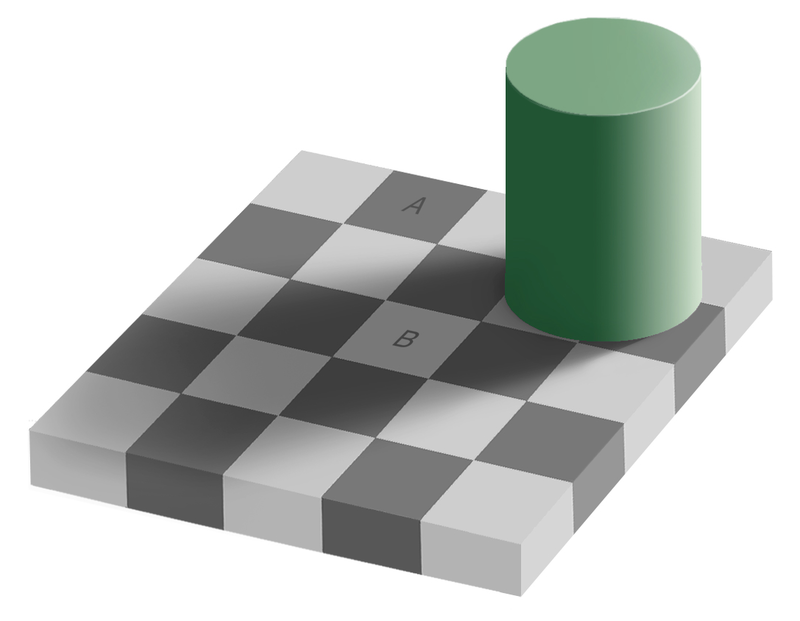 Squares A and B are exactly the same color, RGB 120, 120, 120 or HTML #40B09C. Cross my heart. 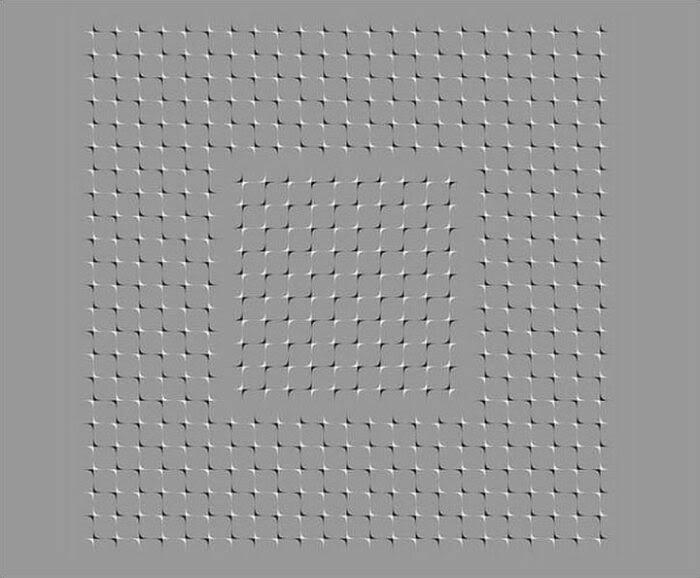 This animated GIF file is less of an illusion than an interesting phenomenon, but I thought I’d add it here. Watching the waves move is captivating. The image below is not a .gif file. Watching it makes me woozy. Last one. Click on the spinner below to get a full-size image. Watch the center for about 15 seconds, and then look at the palm of your hand. Try not to faint. 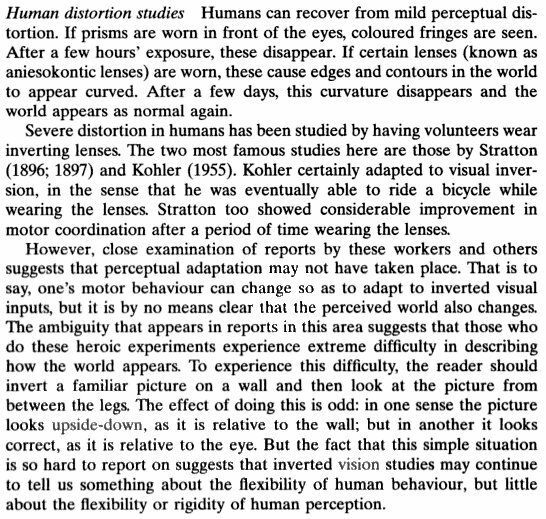 By Alan M. Slater, the famous prism-glasses experiment is mentioned – contrary to conventional wisdom, the subjects may not have “inverted” their world, but a form of adaptation was certainly noted.